Video calling is the most awaiting feature in WhatsApp. In this tutorial, I am going to show you how to activate WhatsApp video call feature on your Android and iOS device. From the last year, the most popular instant messaging app WhatsApp has been working on this project and finally it is in front of you. Almost all major messaging apps have the voice calling facility, and very few of them have the video calling option. The video calling feature has still on the beta stage, but you could easily get it on your smartphone. Once you enabled this option on your smartphone, you have two choices to make calls; voice call and video call. Recently, the official WhatsApp Messenger for Windows and Mac computers have been released. Now you don’t need to look at your phone while working on your computer. With the new desktop app, you could easily get messages as well as all features of a mobile application directly on your desktop screen. Don’t forget to check other WhatsApp Tips and Tricks to learn more about this messenger. 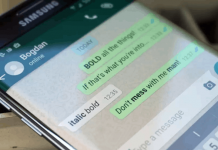 To send Bold, Italic and Strikethrough text in WhatsApp follow our previous post. The calling function is available on the new beta app from the call icon, but it isn’t practical just yet. 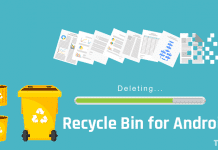 The app is offered to beta testers from Google Play’s beta testing program. If you don’t want to join in the testing program, still you could get it from the ApkMirror website to enable video calling on WhatsAapp. This feature is added from the beta version under 2.16.80. Download the latest APK file from the APK mirror website to watch it in action. The WhatsApp video calling feature can be reached by tapping the same phone icon which was used for voice calling at the top-right corner of the screen inside a specific chat or contact. While previously tapping the icon directly initiated the voice calling. But, now tapping on the call icon will give the users the alternative to choose two options. Either they can make a voice call or a video call to the contact whose chat screen is presently open. The video call option is only available from inside the chat screen and not from the ‘Calls menu‘. Whatsapp only placed two options under the call icon, but the functionality has not started yet. 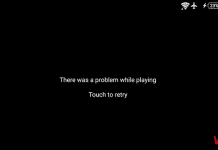 On tapping on the video calling option, the app says “Couldn’t place call. 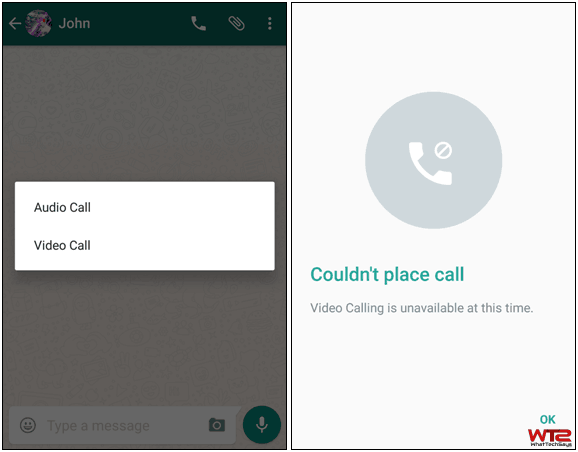 Video Calling is unavailable at this time.” On the other hand, it is not tough to expect that the video calling function on WhatsApp will be added very soon as the feature can now be found within the app.